Democratic Leader Nancy Pelosi spoke in San Francisco on Tuesday about the need for S.B. 822, California’s comprehensive net neutrality bill, alongside State Sen. Scott Wiener, the bill’s principal author. Democratic Leader Nancy Pelosi on Tuesday added her voice to a chorus of California legislators and advocates calling on Governor Jerry Brown to sign Senate Bill 822, legislation that seeks to reenact for California’s 40 million residents the net neutrality protections stripped away by the Federal Communications Commission this year. Calling S.B. 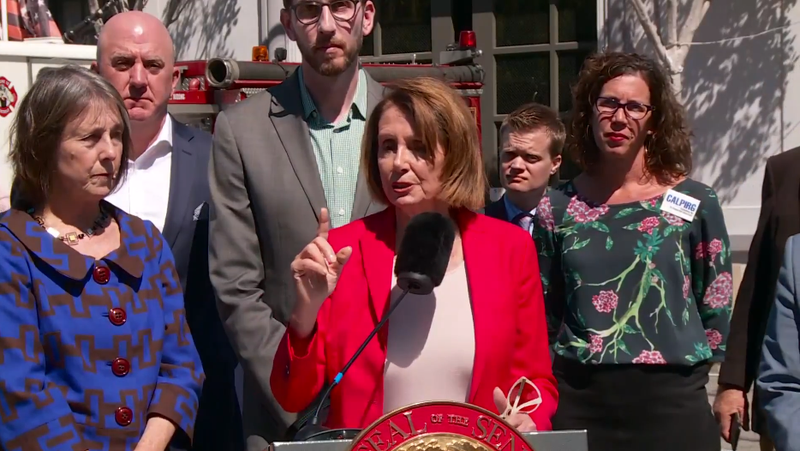 822’s passage an “historic” moment for California, and also vital to its future, Pelosi said the bill would serve to “lead the way” for other states attempting to fight back against the FCC decision. In crediting the various supporters and grassroots groups involved, Pelosi gave special thanks to California’s youth for recognizing the issue’s importance. “Young people, and all the people representing the different aspects of our community, knew how important this was, acted upon that knowledge, and made the difference,” she said. Privately, Democratic aides have expressed confidence that Brown will sign the bill. He was consulted by S.B. 822's authors frequently during its 9-month journey through the legislature. The governor has a policy, however, of not commenting on pending legislation. Tuesday’s press conference is one of several events supporters have planned to make the case to Brown, and to the public, that S.B. 822 should become law. Brown has until the end of the month to sign the bill. In addition to Wiener, Pelosi was joined by State Senator Nancy Skinner and Assemblymembers Rob Bonta and David Chiu, coauthors of S.B. 822. Also present were representatives from local firefighters unions, including Tom O’Connor, president of San Francisco Fire Fighters Local 798. The setting for Tuesday’s event was Fire Department Station 35 in San Francisco. California firefighters became embroiled in the state’s net neutrality fight after it was revealed that Verizon had throttled Santa Clara firefighters’ data speeds as they battled a major North California wildfire, reportedly significantly impacting communications at a crucial command center. In response to the incident, the FCC was widely criticized for having voted to repeal the 2015 Open Internet Order, a decision that essentially abdicated the commission’s authority to restrict Verizon and other internet service providers (ISPs) from throttling other first responders in the future. “When we are working our hardest, we absolutely do not want to worry about being able to communicate between vehicles, with crews, or with dispatch, because that data traffic should flow freely and unimpeded,” he added, saying that since the federal repeal of net neutrality, ISPs have shown they are “more than willing” to place profits over the safety of first responders. Among the advocates invited to speak at the conference was 19-year-old Haleema Bharoocha of the Greenlining Institute. She used her time at the mic to describe the pivotal role a free and open internet plays in giving a voice to Muslim women, who, she said, have been largely excluded from the #MeToo movement. Asked if legal threats had been made in response to the bill’s passage, Sen. Wiener said that AT&T, Verizon, and Comcast, among others, had “made very clear” they planned to sue.